Calendar of Treasury Books, Volume 4, 1672-1675. Originally published by His Majesty's Stationery Office, London, 1909. This free content was digitised by double rekeying and sponsored by the Arts and Humanities Research Council. All rights reserved. Nature and Substance of the Entry. Warrant from Treasurer Danby to Tho. Agar and Charles Strode, Surveyors General of Woods, Trent South, and to Thomas Newton, gent., Woodward of Whittlewood Forest, and the Verderers, Regarders, &c., of said Forest to fell sufficient trees in said forest to repair the lodges at Woodstock, co. Oxford. not exceeding 123 tons of timber and rendering a proper account of the offal, &c. Warrants Not Relating to Money V. pp. 248-9. The Barons of the Exchequer, the Attorney and Solicitor General, Serjeant Maynard and Serjeant Baldwin to be at the Treasury Chambers at three in the afternoon [of this day] about the statutes of Recusancy. Mr. Wharton's business to be put off till Wednesday week, the 24th inst. Day Book, p. 87. Charles Bertie to [the Auditor of the Receipt] to pay the 3,000l., lately brought into the Exchequer by the Chimney Farmers, to Sir Stephen Fox on any late orders of his for secret service. Money Book (General), p. 94. Royal sign manual for 200l. to Hugh May, Comptroller of the Works, as imprest, to be employed about the plantations at St. James's Hampton Court and Greenwich Parks. (Money warrant hereon, dated Feb. 26.) King's Warrant Book IV. p. 258 ; Money Book (General), p. 16 ; Money Book (Pensions), pp. 11-12. Same to the Attorney or Solicitor General for a great seal for a grant to Thomas Millward (Milward) of the annuity or yearly pension of 80l. in consideration of his faithful service to the Queen Consort as provider of the Robes to said Queen in the place of William Hinton, deceased : the first payment to commence from Lady Day last. (Treasurer Danby's subscription, dated Mar. 8, of docquet hereof.) King's Warrant Book IV. p. 259 ; British Museum Additional MS. 28,075, p. 161. Same to Nathaniel, Bishop of Durham, to the like effect ut supra, p. 604. concerning the undue signing by clergymen, &c., of certificates of exemption from Hearthmoney. We recommend it to your care to strictly charge all ministers, parsons, vicars, curates and churchwardens within your diocese to use all possible circumspection in the signing of any certificates. King's Warrant Book IV. pp. 260-1. Royal warrant for a privy seal authorising the Auditors of Imprests, in making up Henry, Lord Mansfield, Earl of Ogle's account, as late Master of the Robes during the time he officiated as such, to charge him with 8,918l. 7s. 6d. received of Lawrence Hyde, now Master of the Robes, and with 1,224l. 7s. 10d. issued to Francis Trimly, and with 947l. 12s. 0d. issued to Thomas Langham. "and to make allowance of the said sums according to the directions of a warrant under His Majesty's signet and sign manual" in regard the said sums are part of 15,563l. 11s. 5d., whereof said Earl is, by warrant under the King's sign manual, to be discharged. (Treasurer Danby's subscription, dated Mar. of docquet hereof.) Ibid, p. 151 ; British Museum Additional MS. 28,075, p. 169. Royal sign manual for 160l. to Jonas Shish as royal bounty. (Money warrant, dated Feb. 26 hereon.) King's Warrant Book IV. pp. 262-3 ; Money Book (General), p. 16 ; Money Book (Pensions), pp. 12-13. The Commissioners of the Customs and Mr. Trott to be summoned [to attend the Treasury] at three [this afternoon] and Capt. Kingsland also about the difference betwixt the Bermudas Company and Mr. Trott concerning the Company's duty. Day Book, p. 87. Charles Bertie to Sir Stephen Fox to pay Mris. [Nell] Gwi[nn] 500l., "which is not to be accompted any part of her allowance." Money Book (General), p. 94. Privy seal to Treasurer Danby to authorise the Customs officers to permit Francis Sandford, Esq., one of the officers at arms, to import, Customs free, 8,000 reams of demi or other paper within the space of five years from date hereof, he having undertaken the compiling and printing of a Geneological history of the Kings of England, with sculptures, "which we do look upon as a work of public use and very necessary for the preservation of the seals, monuments and epitaphs . . . we being graciously disposed to gratify the petitioner in his suit to encourage him to proceed in the finishing and perfecting of the said work." (Royal warrant, dated Feb. 8, for said privy seal. Treasurer Danby's subscription, dated Feb. 24, of docquet hereon. 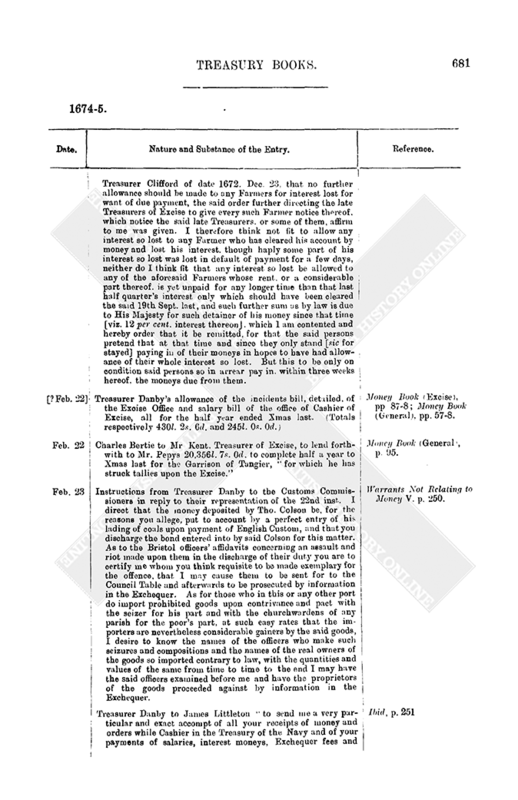 Treasurer Danby's warrant, dated Feb. 28, hereon to the Customs Commissioners.) King's Warrant Book IV. pp. 246, 257-8 ; British Museum Additional MS. 28,075, p. 148 ; Warrants Not Relating to Money V. p. 251. The Lord Chief Baron and the other Barons of the Exchequer, the Attorney and Solicitor General, Serjeant Mainard and Serjeant Baldwin to be summoned [to attend the Treasury today] about the doubts upon the statutes of Recusancy. Mr. Philpot's business about Norley Thorns, &c. [to be considered this day by the Lord Treasurer]. Sir C. Harbord to attend. Day Book, p. 87. Warrant from Treasurer Danby to the Customs Commissioners to permit Admiral Tromp to ship, Customs free, 6 trunks. 2 wooden chests, 2 chests with glasses, 2 hampers with bottles, 1 chest, 2 portmanteaus, a little trunk, a little cellar with strong waters and a table, being his proper goods. Warrants Not Relating to Money V. p. 249. Charles Bertie to the Auditor of the Receipt to pay Sir Francis Winnington, the Solicitor General, what is due to him on his salary as a King's Counsel. Money Book (General), p. 95. Sir John Trevor, by Mr. Lloyd, desires that no warrants be signed for Butlerage and Prizage till Counsel be heard on behalf of the Duchess of Cleveland. Caveat Book, p. 11. Charles Bertie to the Treasurer of the Navy to pay one year's wages to the officers and company of the "Greyhound" frigate. Money Book (General), p. 95. Same to Mr. Stephens to pay an order on the Customs for 100l. in Mr. Richard Bertie's name "as you formerly did the 1,000l. by my Lord Treasurer Clifford's direction." Ibid. Sir Christopher Musgrave, understanding there is a petition to the Lord Treasurer from one Lancelot Sympson (complaining against the officers of the Customs in Carlisle port about seizing Scotch cattle and by reason of the many abuses committed by them he prays a commission that he may be employed in those seizures), Sir Christopher desires to be heard before anything be done in this business. Caveat Book, p. 11. 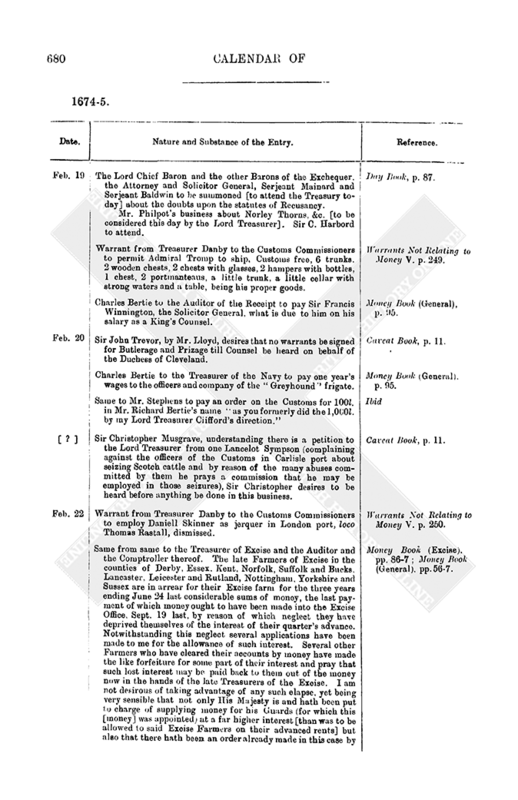 Warrant from Treasurer Danby to the Customs Commissioners to employ Daniell Skinner as jerquer in London port, loco Thomas Rastall, dismissed. Warrants Not Relating to Money V. p. 250. Same from same to the Treasurer of Excise and the Auditor and the Comptroller thereof. The late Farmers of Excise in the counties of Derby, Essex. Kent, Norfolk, Suffolk and Bucks, Lancaster, Leicester and Rutland, Nottingham, Yorkshire and Sussex are in arrear for their Excise farm for the three years ending June 24 last considerable sums of money, the last payment of which money ought to have been made into the Excise Office, Sept. 19 last, by reason of which neglect they have deprived themselves of the interest of their quarter's advance. Notwithstanding this neglect several applications have been made to me for the allowance of such interest. Several other Farmers who have cleared their accounts by money have made the like forfeiture for some part of their interest and pray that such lost interest may be paid back to them out of the money now in the hands of the late Treasurers of the Excise. I am not desirous of taking advantage of any such elapse, yet being very sensible that not only His Majesty is and hath been put to charge of supplying money for his Guards (for which this [money] was appointed) at a far higher interest [than was to be allowed to said Excise Farmers on their advanced rents] but also that there hath been an order already made in this case by Treasurer Clifford of date 1672. Dec. 23, that no further allowance should be made to any Farmers for interest lost for want of due payment, the said order further directing the late Treasurers of Excise to give every such Farmer notice thereof, which notice the said late Treasurers, or some of them, affirm to me was given. I therefore think not fit to allow any interest so lost to any Farmer who has cleared his account by money and lost his interest, though haply some part of his interest so lost was lost in default of payment for a few days, neither do I think fit that any interest so lost be allowed to any of the aforesaid Farmers whose rent, or a considerable part thereof, is yet unpaid for any longer time than that last half quarter's interest only which should have been cleared the said 19th Sept. last, and such further sum as by law is due to His Majesty for such detainer of his money since that time [viz. 12 per cent. interest thereon], which I am contented and hereby order that it be remitted, for that the said persons pretend that at that time and since they only stand [sic for stayed] paying in of their moneys in hopes to have had allowance of their whole interest so lost. But this to be only on condition said persons so in arrear pay in, within three weeks hereof, the moneys due from them. Money Book (Excise), pp. 86-7 ; Money Book (General), pp. 56-7. Treasurer Danby's allowance of the incidents bill, detailed, of the Excise Office and salary bill of the office of Cashier of Excise, all for the half year ended Xmas last. (Totals respectively 430l. 2s. 6d. and 245l. 0s. 0d.) Money Book (Excise), pp. 87-8 ; Money Book (General), pp. 57-8. Charles Bertie to Mr. Kent, Treasurer of Excise, to lend forthwith to Mr. Pepys 20,356l. 7s. 0d. to complete half a year to Xmas last for the Garrison of Tangier, "for which he has struck tallies upon the Excise." Money Book (General), p. 95. Instructions from Treasurer Danby to the Customs Commissioners in reply to their representation of the 22nd inst. I direct that the money deposited by Tho. Colson be, for the reasons you allege, put to account by a perfect entry of his lading of coals upon payment of English Custom, and that you discharge the bond entered into by said Colson for this matter. As to the Bristol officers' affidavits concerning an assault and riot made upon them in the discharge of their duty you are to certify me whom you think requisite to be made exemplary for the offence, that I may cause them to be sent for to the Council Table and afterwards to be prosecuted by information in the Exchequer. As for those who in this or any other port do import prohibited goods upon contrivance and pact with the seizer for his part and with the churchwardens of any parish for the poor's part, at such easy rates that the importers are nevertheless considerable gainers by the said goods, I desire to know the names of the officers who make such seizures and compositions and the names of the real owners of the goods so imported contrary to law, with the quantities and values of the same from time to time to the end I may have the said officers examined before me and have the proprietors of the goods proceeded against by information in the Exchequer. Warrants Not Relating to Money V. p. 250. Treasurer Danby to James Littleton "to send me a very particular and exact accompt of all your receipts of money and orders while Cashier in the Treasury of the Navy and of your payments of salaries, interest moneys, Exchequer fees and charges and of what money and orders you paid and delivered to the Victuallers : also an accompt of the money and orders remaining in your trust, whether in your own hands or in the hands of any goldsmith or other, and likewise an accompt of what is due and owing to the Chest or otherwise howsoever." Ibid, p. 251. Charles Bertie to the Auditor of the Receipt to pay to Mr. Le Gouch 500l. in further part of his order for 2,900l. Money Book (General), p. 95. Same to Edward Seymour, Treasurer of the Navy out of any moneys in his hands to appoint the payment of two years' wages ("that is one year more than the Lord Treasurer directed the 20th inst.") to the officers and company of the "Greyhound" frigate. Ibid. Same to the Auditor of the Receipt to pay Mris. Bolton 100l. upon her warrant of Nov. 13 last. Ibid. Same to same to levy forthwith a tally on the Farmers of the Alum Works for 200l. to be paid to Sir George Charnock on his dormant warrant confirmed by Treasurer Danby ; viz., for one year to Xmas last. Ibid. Same to same for the like tally for 100l. to Mr. Gerrard Fox for one year to same date. Ibid. Same to the Commissioners of the Navy. The Admiralty Commissioners have advised Treasurer Danby of the contract made by you, by the King's order, with Phineas Pett, master shipwright of the King's yard at Chatham, to build a fly boat to be employed against the Sallee men of war, and that you cannot imprest money to Pett thereon without Treasurer Danby's direction. You are to make such imprest and make Pett out a perfect bill of the whole (abating the imprest) at his delivery of said ship completed : and you are to pay same out of any money in the Treasury of the Navy. Ibid, p. 96. Same to the Auditor of the Receipt to levy tallies on the Excise for 500l. to Lord Arlington for Xmas quarter last on his pension. Ibid. Treasurer Danby's subscription of a docquet, dated 1674-5, Feb., of a grant to the Countess of Portland (upon a surrender by her of her licence to transport woollen cloths for the remainder of the term of 31 years, granted in May, 1661, under the yearly rent of 100l., which is about 13 years in arrear) of the like licence to the said Countess for 31 years from Sept. 29 last, under the like yearly rent of 100l. : together with a pardon of the above arrears and of all errors and miscarriages in the execution of the former grant. British Museum Additional MS. 28,075, pp. 149-50. Same of same, dated same, of a grant to William Turner (one of His Majesty's private music in ordinary for the lute and voice, in the place of Henry Cook, deceased), of the wages and fee of 40l. per an. and 20l. yearly for strings : to be paid quarterly from 1672, Sept. 29. Ibid, p. 150. Same of same, dated same, of a grant of the yearly fee of 200l. to Nicholas Staggins, master of His Majesty's music, loco Lewis Grabu : to be payable quarterly from Sept. 29 last. Ibid, p. 151. Privy seal for 3,000l. to Secretary Henry Coventry for secret service. (Royal warrant, dated Feb. 8, for said privy seal. Treasurer Danby's subscription, dated Feb. 24, of docquet hereof. Money warrant hereon, dated Feb. 27.) 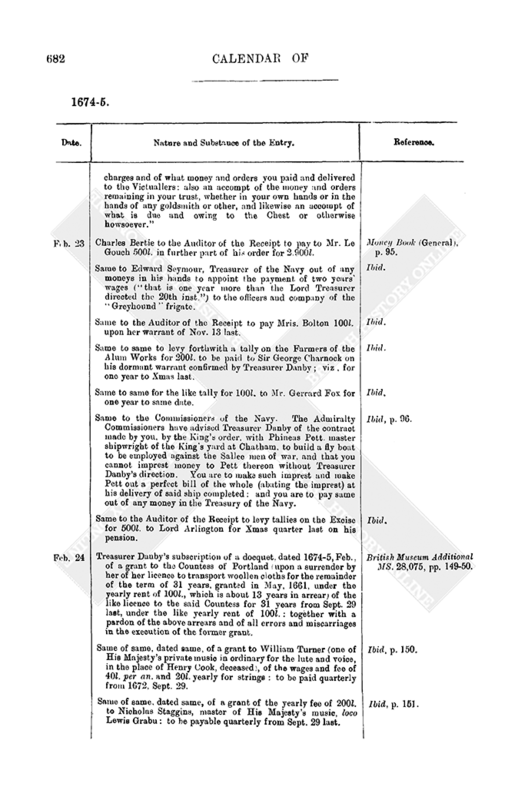 King's Warrant Book IV. pp. 246, 263 ; British Museum Additional MS. 28,075, p. 148 ; Money Book (General), p. 18 ; Money Book (Pensions), p. 18. Same for 2,000l. to Secretary Sir Joseph Williamson for secret service. (Royal warrant, dated Feb. 12, for said privy seal. Treasurer Danby's subscription, dated Feb. 24, of docquet hereof. Money warrant hereon, dated Feb. 27.) Ibid, pp. 257, 264 ; Ibid. ; Ibid. ; Ibid. Charles Bertie to the Customs Cashier to pay 2,000l. into the Exchequer. Money Book (General), p. 96. Treasurer Danby's subscription of a docquet, dated 1674-5, Feb., of grant of the yearly pension of 100l. to William Glascocke as one of His Majesty's Masters of Requests. British Museum Additional MS. 28,075, p. 152. Same of same, dated same, of a grant and confirmation to the Mayor and commonalty of the city of New Sarum, co. Wilts., of all their ancient liberties, privileges and franchises to them heretofore granted by any of His Majesty's predecessors : with the present nomination of the Mayor, Recorder [and] 24 Aldermen : the present [each year's] Mayor, Recorder, the last Mayor and 10 senior Aldermen to be Justices of the Peace : a Clerk of the Statutes and 30 assistants : and with these further additions. (1) That the Mayor and Aldermen may some convenient time before the day appointed for the election of the Mayor, meet and choose two persons out of such as may be chosen mayors for the said city, which persons so chosen the mayor for the time being shall nominate to the Common Council one of which persons the Common Council shall choose mayor for the year ensuing. (2) That the Mayor and Commonalty may within 15 days or other convenient time after the death or removal of the Clerk of the Statutes name another person to succeed him. (3) The number of assistants being formerly 48 is now reduced to 30 and that 25 out of the Mayor, Recorder, Aldermen and Assistants (whereof the Mayor or Recorder to be one) shall be a Common Council. (4) That if any Alderman or Assistant shall upon notice given him by a serjeant at mace refuse to be present at the Councils of the said city each Alderman for every such default shall forfeit 5s. and every Assistant 2s. 6d. (5) That if the Mayor elect shall refuse to accept the office the Mayor and Aldermen or any eight of them have power to impose on the person refusing a fine not exceeding 100l. (6) That all fines and forfeitures accruing to the said Mayor and Commonalty shall be levied by warrant under the common seal directed to one of the Serjeants at Mace by distress of the offender's goods or recovered by action of debt. (7) Their power of purchasing is enlarged to lands not exceeding 500l. per an. (8) The Mayor and Aldermen, or the greater part of them, have power to choose a deputy recorder who in the absence of the recorder is to be of the quorum and have all the powers of a recorder with a reservation to the King, his heirs and successors, of having the approbation of all succeeding recorders. Together with such clauses and nonobstantes as are usual in grants of this nature. Ibid, pp. 152-4. Renewal and re-signature by Treasurer Danby of a money warrant of 1673-4, Feb. 2, for 40l. to the Earl of Essex. Ibid, 28,076, p. 198. Warrant from Treasurer Danby to the Customs Cashier to pay 20l. to the Earl of Chesterfield for one year's creation money. Money Book (General), p. 49 ; Money Book (Customs), p. 192. The like for 50l. to Ellis Lloyd and John Morgan for Xmas quarter last on their pension as by their patent of Oct. 9 last. 50l. to Richard Topham for same on same as by the patent of Oct. 9 last. Money Book (General), p. 49 ; Money Book (Customs), pp. 192-3. Mr. Wharton's business about the saltpetre [is to be considered to-day]. Mr. Philpott's business [also]. Day Book, p. 87. Warrant from Treasurer Danby to the Receipt to take in and cancel a tally for 5,000l., dated 1673, Nov. 3, struck in the Exchequer in the name of the late Farmers of the London Excise, for William Ashburnham, Cofferer of the Household, and in place thereof to strike two tallies of the same date, one for 4,000l. on the late Farmers of the London Additional Excise, the other for 1,000l. on the Excise for the time being. 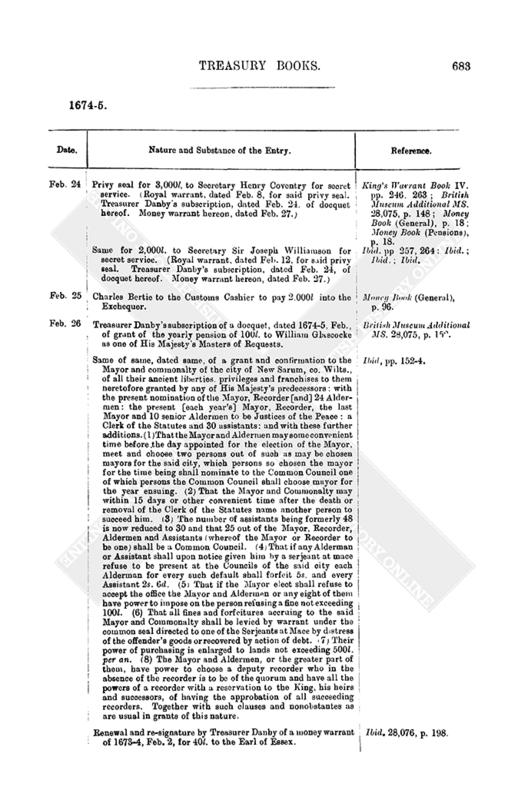 Money Book (Excise), p. 89 ; Money Book (General), p. 59. Money warrant upon 18l. 5s. 0d. to Alexander Whyte for one year on his fee as plumber at Windsor. Money Book (General), p. 16 ; Money Book (Pensions), p. 12. Letter of direction for 400l. in full of an order dated 1670, Nov. 8, for 4,000l. to Sir Robert Vyner, which has, by several assignments, come to the late Farmers of the London Excise (old and additional) and allowed upon making up their accounts : same being hereby to be paid by levying a tally for 400l. on the late Farmers of the London Additional Excise. Ibid ; Ibid. Money warrant for 300l. to Andrew Lawrence in part of 518l. 10s. 8d. overpaid by him as Surveyor of the [King's private] ways, gates, bridges, &c. Ibid, p. 17 ; Ibid, p. 13. Same for 138l. 13s. 4d. to Col. Whitley for half a year on his fee of 20 marks per an. and for 264 days' allowance on his 10s. a day as Knight Harbinger. Ibid, p. 17 ; Ibid, p. 14. Same for 100l. to William Ashburnham, to be by him paid to Mris. Christina Cooper for half a year on her pension in part of two years' arrears thereon to Xmas last. Ibid, p. 17 ; Ibid, p. 15. Same for 91l. 5s. 0d. to Mr. Kirke for one quarter on his pension of 365l. per an. as housekeeper of Whitehall. Ibid, p. 17 ; Ibid, p. 16. Same for 51l. 11s. 8d. to James Marriott for one year on his several fees of 12d. a day and 33l. 6s. 8d. per an. as Keeper of His Majesty's Wardrobe at Hampton Court. Ibid ; Ibid. Same for 200l. to William Levitt for two years on his annuity Ibid, p. 18 ; Ibid, p. 17. Same for 20l. to the Earl of Burlington for one year's creation money. Ibid ; Ibid. Same for 240l. to Thomas Felton for two years on his pension as Page of Honour, &c. Ibid ; Ibid. Letter of direction on 1,000l. in part of an order dated 1669, July 7, for 5,263l. 6s. 8d. to Sir William Bowles and Robert Childe, Master of the Tents : same to be hereby paid by a tally on the Hearthmoney farm rent due in March next. Ibid, p. 19 ; Ibid, p. 21. Money warrant for 150l. to Visct. Falkland for half a year to Sept. 29 last on his annuity. Ibid, p. 19 ; Ibid, p. 23. Money warrant for 75l. to Mris. Honora Harding for one quarter on her pension. Money Book (General), p. 20 ; Money Book (Pensions), p. 24. Same for 2,324l. to Sir Allen Apsley, Master of the Hawks, due as follows, viz. : 294l. for one year and 223 days to Dec. 18 last on his fee of 10s. a day ; 630l. for 21 months to same date on his allowance of 30l. per month ; 1,400l. for 1 years to Xmas last on his allowance of 800l. per an. Ibid, pp. 20-1 ; Ibid, p. 26. Same for the Sergeant of the Hawks [viz.] : Geo. Russell, senr., 32l. 10s. 0d. ; Geo. Russell, junr., 24l. 18s. 4d. ; [and to the following as] the King's falconers being half a year each. viz. ; William Poulton, 25l. ; Richard Edes, 22l. ; Abell Daniell, 22l. ; James Roper, 19l. 0s. 2d. ; John Cary, 45l. 10s. 0d. ; William Sakins, 25l. 1s. 10d. ; Thomas Dechamp, 22l. ; Th. Duffield, 22l. ; John Legg, 25l. ; (separate warrant for same of same date crossed through) ; John Burchill, ; Mar. Conway, 40l. ; Ar Wichell, 25l. 1s. 10d. ; Jo. Haward, 25l. 1s. 10d. ; Jasp. Everard, 25l. ; Sil. Rowley, 25l. 1s. 10d. ; Jo. Osbalston (no sum stated in either authority for Osbaldeston : a separate warrant for 15l. 19s. 4d. for him for half a year and dated Feb. 26 marked vacated). Ibid, p. 21 ; Ibid, pp. 22, 23, 26. Same for 100l. to Mris. Jane Berkeley for half a year on her pension. Ibid, p. 22 ; Ibid, p. 29. Warrant, dormant, from Treasurer Danby to the Receipt for the payment to William Roberts, Receiver of the Honor of Windsor, of all moneys that shall be paid into the Receipt arising by fines, issues, amerciaments, recognizances, or otherwise, commonly called Greenwax : to be employed as by the privy seal of Aug. 31 last for the rebuilding of the several lodgings set apart for the King, Queen, and Duke of York in Windsor Castle : until the said work is finished. Ibid, p. 23. Money warrant for 26l. 13s. 4d. to John Jones for half a year on his several fees as His Majesty's apothecary. Ibid, p. 25. Royal warrant to the Attorney General for a great seal for erecting an office of Receiver General and Cashier of Excise and for granting same, with the salary of 600l. per an., to Richard Kent, who "hath lately made an humble proposal unto us for receiving of our revenue of Excise and for paying and disposing of the same in a better method and with more advantage to our service than heretofore" : said office to be open from 8 till 12 and from 3 till 6 every day except Sundays and hollydays. Said Kent only to be accomptable for his actual receipts and to have defalcation for all costs of passing his accounts. "And forasmuch as the said Richard Kent hath proposed to advance unto us, upon request of our High Treasurer, from time to time, for our urgent and immediate service, several great sums of money upon tallies to be struck upon our [Excise] revenue aforesaid, and hath already, in pursuance of his said proposal, advanced and lent unto us several great sums of money, upon the credit of such tallies," for the security of such loans so made or to be made, with 6 per cent. interest thereon, it is hereby declared that he shall be reimbursed such sums (by him or any other persons so advanced or to be advanced) out of the hereditary Excise, and that all such tallies as shall be struck upon any part of the revenue of Excise and which shall be delivered to said Kent as security of any money by him advanced as aforesaid shall be repaid by said Kent or by such other person or persons as shall have the receipt or government of the said revenue, in course and according to the precedence of the dates of such tallies, and shall be preferable and preferred before any other payments to be made out of the said revenue except only the 10,972l. 19s. 3d. per an. and 1,236l. 16s. 1d. per an. to the Queen Consort and the 24,000l. per an. to the Duke of York. 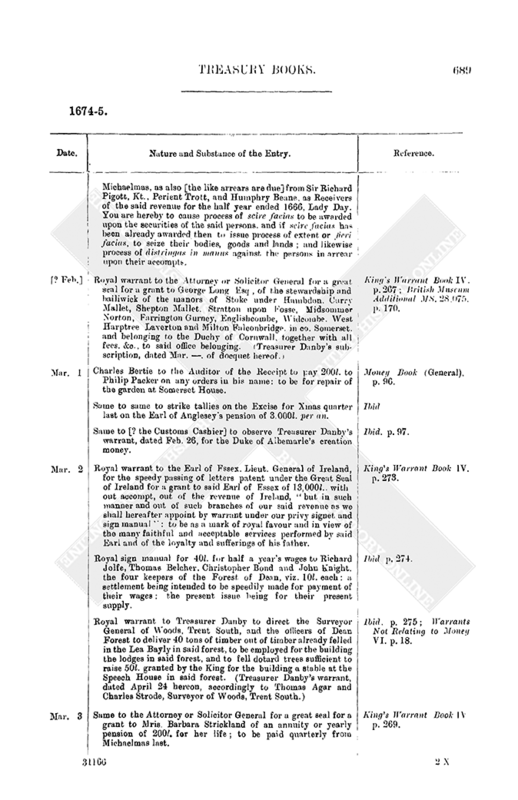 King's Warrant Book IV. pp. 298-307. Warrant from Treasurer Danby to Sir C. Harbord, Surveyor General of Crown Lands, for a particular and ratal of the water bailiwick of the borough of Dartmouth and of the port, precincts and liberties of the same, with a view to a renewal of the lease of same possessed by the Mayor, bailiffs and burgesses of the borough of Clifton Dartmouth Hardnes, said lease being a long term, but determinable upon two lives in being. By your report on the petition of said Mayor, &c., it appears that in the Commonwealth survey all the profits of said office were then valued but at 6l. 6s. 8d. above the old rent of 14l. 13s. 4d., "since which time you fear those profits are much abated by the decay of Newfoundland fishing and of the trade of that place [Dartmouth] in general by reason of the late wars" wherefore you recommend a renewal of lease for three lives for a fine of 20l., which I hereby approve. Warrants Not Relating to Money V. pp. 260-1. Treasurer Danby to Francis Parry, His Majesty's Agent at Lisbon. It is represented to me by your letter of Dec. 30 that you had then ready in your hands about 4,800 melreys of the money of the Queen's portion, and that wanting a frigate whereon to ship the same you had offered it to Mr. Clarke, Agent to Alderman Backwell, who for some reasons had waived the acceptance thereof. You are hereby required to ship the said sum and all other money which may by that time be in your hands on board Her Majesty's ship the "Sandados." if then at Lisbon, taking caution according to the method formerly prescribed in like cases. You desire to know whether, when a fair opportunity of shipping home the [Queen's] portion money does present [itself], you may allow the rebate of Custom House bills that are then in your hands, which in that place [Lisbon] is in proportion of 4 per cent. for the bills payable in three months and of 8 per cent. for the bills payable in six [months]. I hereby direct you to proceed herein with regard to the prospect you have of future conveniences of shipping by the time such bills would of themselves expire ; and in case you have at any such time so many bills in hand as amount to 300l. or thereabouts that you rather allow the rebate of bills and despatch home the money than that the money should lie there dead for want of shipping. Ibid, p. 262. Warrant from same to the Customs Commissioners to deliver to the Earl of Arlington a case of gilt leather and a case of stuff imported from Rotterdam in the "Griffin," Direck Reyne master, being for said Lord's private use. Ibid, p. 263. 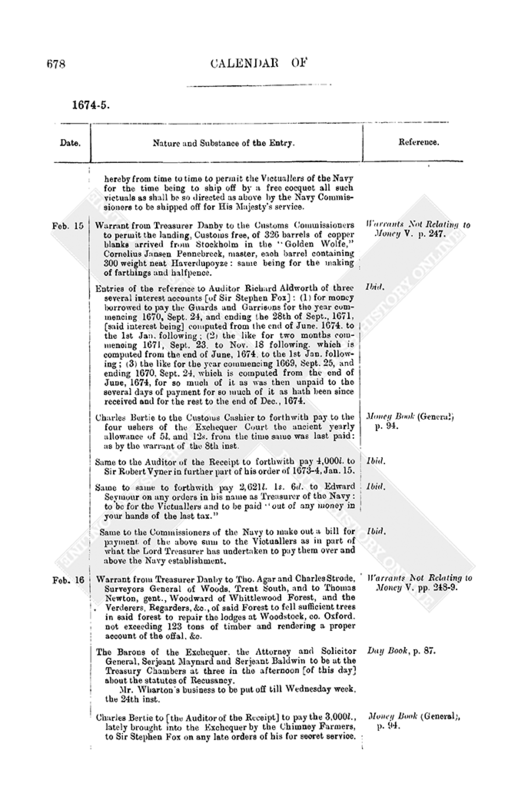 Same from same to the Clerk of the Pipe for a lease to Sir Samuell Moreland, kt. and bart., for 31 years from Sept. 29 last of the mansion house called Fauxhall, with the appurtenances and the yards, gardens and backsides thereto belonging. 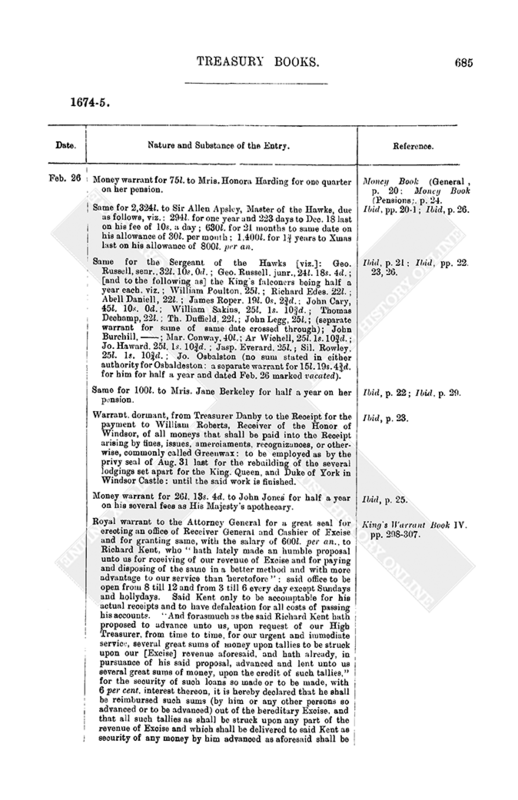 The grant to be without fine in consideration of several sums of money expended by said Moreland in His Majesty's service and for divers acceptable services by him performed to His Majesty : but a special clause of resumption to be inserted. Prefixing :Particular of the premises and the Surveyor General's ratal thereof. Ibid, pp. 270-1. Warrant from Treasurer Danby to the Clerk of the Pipe for a lease to Robert Brent of the farm of tithes and other things within the vicarage of Halifax, co. Yorks, parcel of the possessions of the late monastry of Lewes, co. Sussex, and heretofore demised, 3 June. 26 Hy. VIII., to John Waterhouse et al. for 99 years under the rent of 95l. 6s. 8d., part of which tithes, viz. the tithes of wool and lamb in the townships of Sowerby, Erringden, Greetland, Fixby, Toothill and Rastrick in the said vicarage, and one yearly pension of 1l. 6s. 8d. due out of the church of Harthill, and one other yearly pension of 6s. 8d. due out of the church of Sandal were granted in fee farm the 8th Dec., 7 Car. I., to William Collins and Edw. Fenn, under the yearly rent of 6l. (which rent is since sold by the Trustees for sale of Fee Farms to Ferdinando Bucknall and others and their heirs) : and the residue of the said tythes and things in Waterhouse's leases was divided into three parts under three several rents, viz. (1) the tithes of corn or grain of the township of Greasbrough, Dalton and Morthen, in Rotherham parish, with a yearly pension out of the church of Rotherham, demised to Robert Swift under the yearly rent of 9l. 3s. 4d. ; (2) the tithes of corn or grain and hay of the townships of Halifax, Skircoat, Northowram, Shelf, Hipperholme, Southowram, Ovenden, Brighouse, Rastrick, Fixby, Toothill, Sowerby, Erringden, Langfield, Mankynhoyles, Soyland, Rishworth, Norland, Barsland, Stainland, Elland, Greetland, Conisbrough, Warmsworth, Butterbush, Thrybergh, Ranfeild [? Rawfolds], Woodlaiths, Clifton, Crokewell, Braithwell and Micklebring, with their hamlets, members and appurtenances and two tithe barns called the tithe barns of Conisbrough and Braithwell with a chamber and cowhouse under the same at the West end of the capital messuage belonging to the late priory in Braithwell, with half an acre of land lying about the said barns, under the yearly rent of 58l. 6s. 8d. 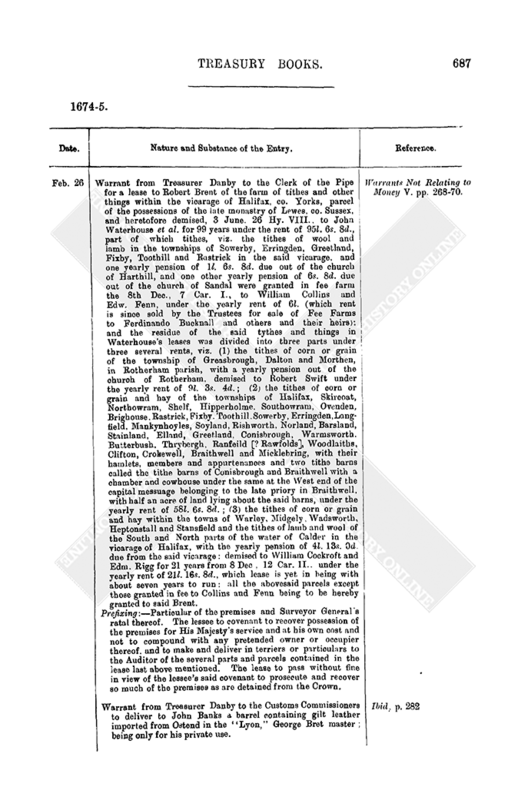 ; (3) the tithes of corn or grain and hay within the towns of Warley, Midgely, Wadsworth, Heptonstall and Stansfield and the tithes of lamb and wool of the South and North parts of the water of Calder in the vicarage of Halifax, with the yearly pension of 4l. 13s. 0d. due from the said vicarage : demised to William Cockroft and Edm. Rigg for 21 years from 8 Dec, 12 Car. II., under the yearly rent of 21l. 16s. 8d., which lease is yet in being with about seven years to run : all the abovesaid parcels except those granted in fee to Collins and Fenn being to be hereby granted to said Brent. Prefixing :Particular of the premises and Surveyor General's ratal thereof. 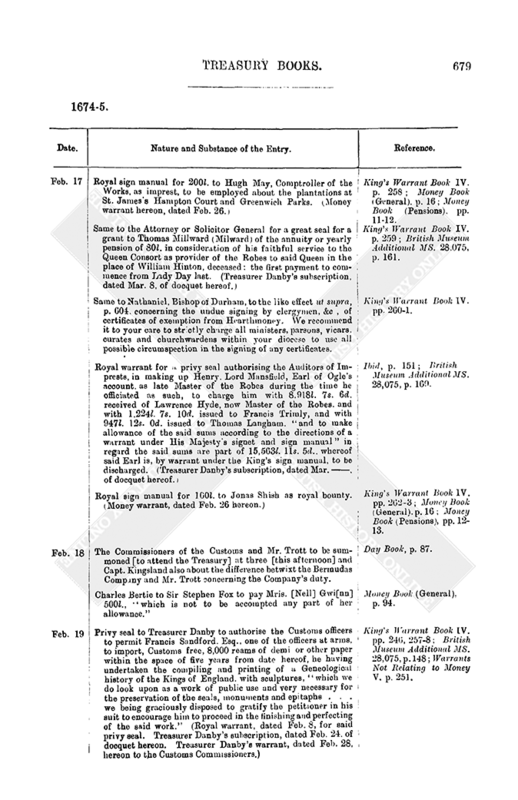 The lessee to covenant to recover possession of the premises for His Majesty's service and at his own cost and not to compound with any pretended owner or occupier thereof, and to make and deliver in terriers or particulars to the Auditor of the several parts and parcels contained in the lease last above mentioned. The lease to pass without fine in view of the lessee's said covenant to prosecute and recover so much of the premises as are detained from the Crown. Warrants Not Relating to Money V. pp. 268-70. Warrant from Treasurer Danby to the Customs Commissioners to deliver to John Banks a barrel containing gilt leather imported from Ostend in the "Lyon," George Bret master ; being only for his private use. Ibid, p. 282. Warrant from Treasurer Danby to the Surveyor General of Crown Lands for a particular of the toll and tin farm or toll tin arising within the manor of Helston in Kerrier, Townington and half the manor of Tywarnhaile, in Cornwall, parcel of the Duchy of Cornwall, and of the toll tin arising within the several manors of Carnedon Pryor, Treverbyn Courtney, Stoke, Calstock, Rillaton and Liskeard, parcel of said Duchy, with a view to a new lease thereof to Arthur Spry, gent., who obtained separate leases thereof, viz. 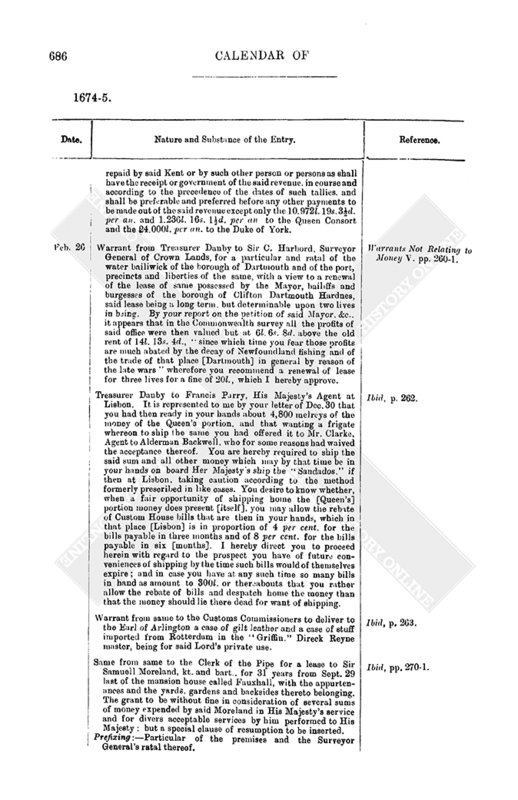 : respectively of 3 Oct., 1670, for 21 years, at the rent of 17l., and of 1670-1, Feb. 18, for 21 years, at 30l., which separate leases were surrendered and replaced by a single lease, 1671, Aug. 4, for 21 years, at 35l. 13s. 4d. per an., being 64l. 6s. 8d. less than the rents reserved in the two former leases : the present grant to pass at the old rent of 35l. 13s. 4d. and a fine of 133l. 6s. 8d., the premises being estimated at 100l. per an. Warrants Not Relating to Money V. pp. 286-7. Same from same to the Customs Commissioners to deliver to Sir Philip Lloyd 18 pictures imported in the ship "Griffin," Dirick Reyne master, directed to the Earl of Arlington, but intended for the private use of said Lloyd. Ibid, p. 259. Charles Bertie to the Auditor of the Receipt to pay 12,000l. to the Treasurer of the Navy : out of the Customs money. Money Book (General), p. 96. Same to same to strike a tally for a quarter of Dr. Troutbeck's pension due at Xmas last. Ibid. Money warrant for 813l. to Sir William Swan for 271 days ordinary (Mar. 29 last to Dec. 25 last) as Resident with the Hanse Towns and 535l. for his extraordinaries, 1670, May 1, to 1674, Nov. 1, as allowed by Secretary Henry Coventry. Ibid, p. 34. Privy seal for the payment to Robert Wyvill, as royal bounty, of the baronetcy fee of 1,095l. due to the King from Sir Edward Nevill, of Grove, co. Notts : all in consideration of said Wyvill's sufferings and loyalty in the late times. (Treasurer Danby's subscription, dated Mar. 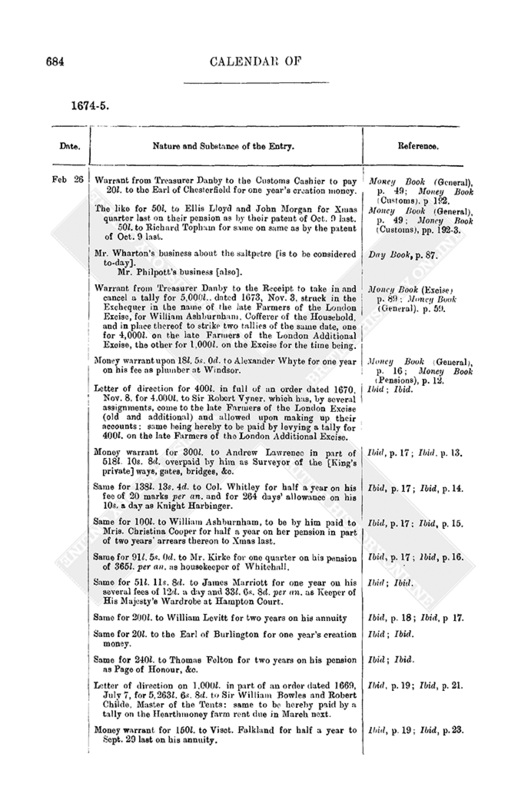 5. of docquet hereof, Warrant hereon to the Receipt dated Mar. 15.) King's Warrant Book IV. pp. 293-5 ; British Museum Additional MS. 28,075, p. 159 ; Money Book (General), pp. 26-7. Same for 40,000l. to Ralph Montagu as imprest for the service of the Great Wardrobe. (Treasurer Danby's subscription, dated Mar. 3, of docquet hereof.) King's Warrant Book IV. p. 334 ; British Museum Additional MS. 28,075, p. 154. Money warrant for 20l. to the Earl of Carlisle for one year's creation money. Money Book (General), p. 18 ; Money Book (Pensions), p. 17. Warrant from Treasurer Danby to [the officers of New Forest]. Mr. George Philpot has a grant from the King of a parcel of ground called Norley Thorns, in New Forest, with the woods [standing] thereon : and has felled several trees there with the object of carrying same away, but is stopped by some of the officers of said forest. You are to permit Philpot to make use of the colewood already felled, which consists of the lops and tops of the said trees, and to carry same away without molestation. Warrants Not Relating to Money V. p. 260. Same from same to the King's Remembrancer. 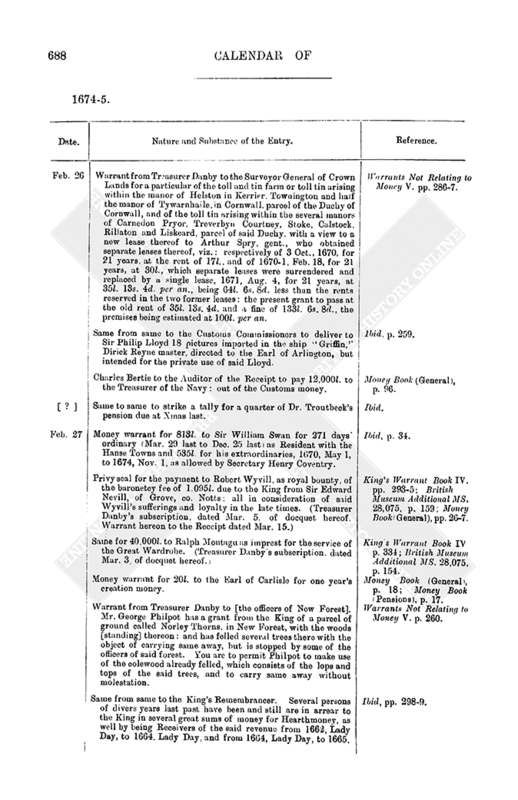 Several persons of divers years last past have been and still are in arrear to the King in several great sums of money for Hearthmoney, as well by being Receivers of the said revenue from 1662, Lady Day, to 1664, Lady Day, and from 1664, Lady Day, to 1665, Michaelmas, as also [the like arrears are due] from Sir Richard Pigott, Kt., Perient Trott, and Humphry Beane, as Receivers of the said revenue for the half year ended 1666, Lady Day. You are hereby to cause process of scire facias to be awarded upon the securities of the said persons, and if scire facias has been already awarded then to issue process of extent or fieri facias, to seize their bodies, goods and lands ; and likewise process of distringas in manus against the persons in arrear upon their accompts. Ibid, pp. 298-9. Royal warrant to the Attorney or Solicitor General for a great seal for a grant to George Long Esq, of the stewardship and bailiwick of the manors of Stoke under Hambdon, Curry Mallet, Shepton Mallet, Stratton upon Fosse, Midsommer Norton, Farrington Gurney, Englishcombe, Widcombe, West Harptree Laverton and Milton Falconbridge, in co. Somerset, and belonging to the Duchy of Cornwall, together with all fees. &c., to said office belonging. (Treasurer Danby's subscription, dated Mar. . of docquet hereof.) King's Warrant Book IV. p. 267 ; British Museum Additional MS. 28,075, p. 170. Version 5.0. © 2017, University of London.